Guest review by Rob Wells. Follow Me In is Katriona Chapman’s debut graphic novel, but she is hardly new to comics, having contributed to various anthologies and self-published eight issues of her comic / zine Katzine in recent years. I am fairly new to Katriona’s work, having only bought the first two issues of Katzine a few months ago, but I enjoyed those two issues so much that she quickly became one of my favourite current comic artists and I pre-ordered Follow Me In as soon as I heard about it. Katriona is an incredibly talented artist, whose beautiful, deceptively-simple pencil drawings – particularly the characters she draws – have a heart-breaking air of sadness about them, which I think is what drew me to her work in the first place, while her tales of everyday life made me a fan. While the stories in Katzine mainly focus on Katriona’s day-to-day life with her current boyfriend, Sergio, she also talks about her love of travel, and Follow Me In fully embraces that love of travel, telling the story of her travels around Mexico with a former boyfriend, Richard, who was an alcoholic. I am a fairly boring man, and also a genuine agoraphobic – nowhere near as bad as I used to be but still not particularly outgoing – so travel has never been big on my agenda and Follow Me In may not seem like an obvious purchase for me. However, the thing that puts me off of travel is the actual travelling – I would like to see the world, I just don’t want to hang around at airports, take any long plane / bus journeys, and spend the whole holiday worrying about the journey home – and as a huge Love and Rockets fan, Mexico is somewhere that actually appeals quite a bit. While the interior art in Katzine is black and white, Follow Me In combines Katriona’s pencil art with vibrant colour throughout and the results are, unsurprisingly, stunning, and really bring her travels around Mexico to life. The story is broken up by numerous pages – often double-page spreads – that provide some background on the history of Mexico, Mexican traditions, Mexican foods, and even travel tips, while the story conveys the vastness of the country and, to my mind, the tedium of travel quite effectively. If anything, reading about all those long bus journeys has made me want to travel even less than I did before! From a graphic medicine point of view, Katriona successfully shows what it must be like to live with an alcoholic, even when they aren’t actually drinking. Only a few of Richard’s drunken binges are depicted, but worse incidents before the journey are referred to – hospitalisation, jobs lost, fist fights, etc. – and the possibility that Richard might get drunk hangs over Kat (as she calls herself here) throughout. Although Kat and Richard share a memorable, life-changing journey together, Richard’s drinking – and the threat of it – gradually pushes them apart. Meanwhile, Kat reconnects with drawing – something she apparently hadn’t done for five years before their journey – and actual drawings she did while in Mexico are scattered throughout the book. My only criticism of Follow Me In is that I thought all the double-page spreads / guides to Mexico broke up the story, somewhat. In fact, although they were all interesting, I found myself reading them quite impatiently so I could get back to Kat and Richard. However, I don’t think putting these sections at the back of the book would have worked as well and my feeling that they interrupted the story didn’t seem to be as much of an issue on a repeat reading, once I knew the journey’s outcome. 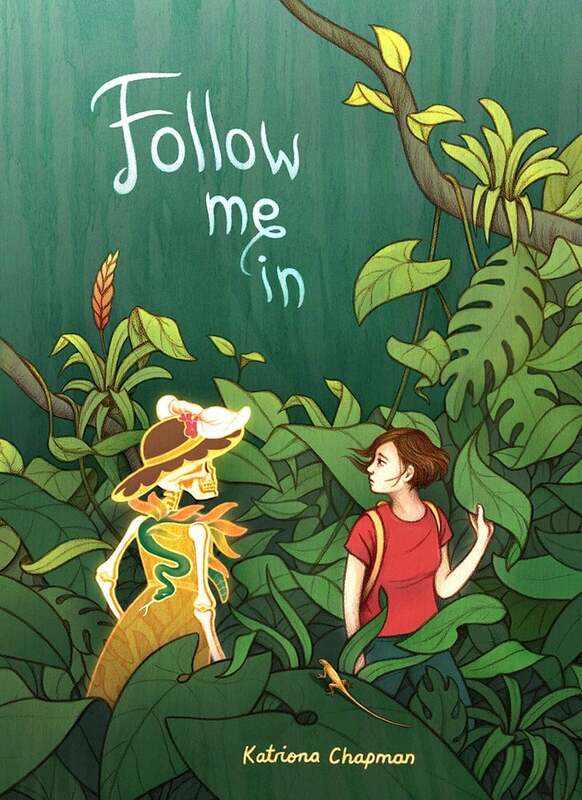 Overall, Follow Me In is a great debut graphic novel and an absolutely stunning guide to Mexico, which has saved me from ever having to travel there. Now I just need Katriona to document a few more journeys to places I’d like to see – New York, Italy, etc. – so that I really don’t have to travel anywhere.